Compost is a rich soil amendment that is made from the process of organic matter breaking down. The most important thing to remember when using compost is that compost is a soil amendment, not a soil itself. Think of compost like a fertilizer—you wouldn’t want to plant your plants in straight fertilizer. Plan on tilling compost in with the first few inches of your existing soil. The amount of compost you need depends on your application. 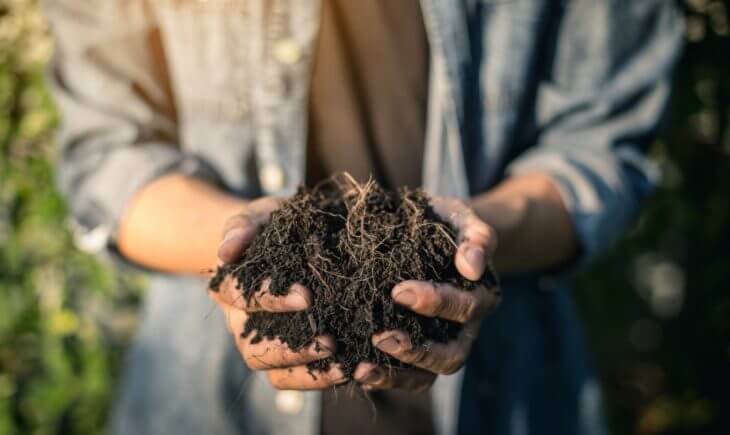 Compost can be used for establishment or maintenance of tree and shrubs, flower gardens, vegetable gardens, lawns, and more. Every project is different, but we will share some general usage guidelines with you. A common use for compost is as a natural fertilizer in a garden. Compost adds organic matter and nutrients to depleted soils, which helps vegetable gardens and flower gardens flourish. When using compost to establish a brand new garden with nothing planted in it yet, you will need to add a higher volume of compost and till it into the soil. Compost should be spread evenly over the entire area at an average depth of 1-2 inches. Next, use a rotary tiller or shovel to incorporate the compost to a depth of 6-8 inches. Higher application rates of compost may be used if the compost is incorporated at a greater depth. After tilling, rake the soil surface smooth and free of large clods, roots, stones, or other material that will interfere with planting. Always remember to water thoroughly after planting, as well. If you are adding compost into an existing garden for maintenance, you will follow a slightly different process. You won’t be able to till the compost into the soil without damaging plants roots. In this case, you can add compost in a thin layer on top of the soil—like a mulch. This will help conserve moisture, suppress weeds, and will add some nutrients into the soil. Lower compost application rates may be necessary for salt-sensitive crops (e.g., strawberries). Also, nutrients in the compost should be considered when adding any fertilizers. Compost will reduce the need for chemical fertilizers. Compost is also commonly used as a top dressing on lawns. Spreading compost on your lawn is a good maintenance practice that promotes lush, green healthy-looking grass. Compost can improve your lawn’s water holding capacity, so you can water less. This practice can be done on an annual basis, and generally the best time to do this is in the spring, just before the growing season. You will want to rent a core aerator to harmlessly remove small plugs of grass over the entire lawn. Next, spread the compost over your lawn in a thin layer (1/4-1/2”), and rake it into the aeration holes. The compost will settle between the blades of grass and provide a nutrient boost for your lawn. Backfill the hole and pat down the soil blend around the root ball. Water thoroughly after planting. Compost is a great addition to many gardening projects. Don’t worry if mixing and tilling compost sounds too labor intensive for you—the ORF offers a variety of premixed compost blends. All compost blends sold at the ORF are ready to plant in. Adding compost will provide numerous benefits for your soil, and we can’t wait until you see your results!